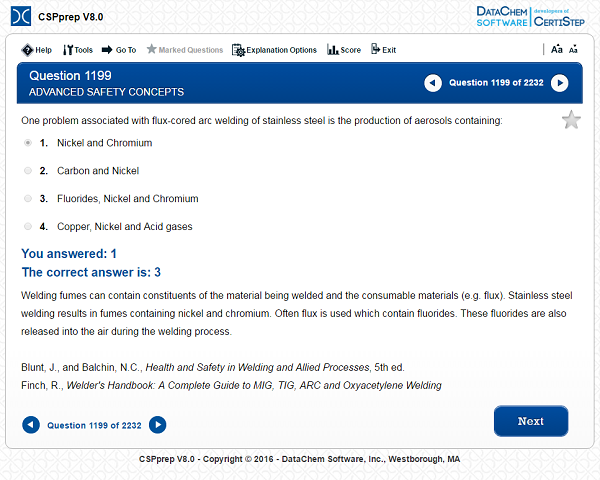 The software is designed to prepare the user for the Certified Safety Professional (V9) certification exam that is offered by the Board of Certified Safety Professionals (BCSP). CSPprep V8.0 is currently authored by Phillip J. Nessler, Jr., a licensed Professional Engineer and Certified Safety Professional. Mr. Nessler obtained a B.S. in Safety Engineering from Texas A&M University and a M.S. in Civil and Environmental Engineering from George Washington University. Individual Licenses can be purchased for various lengths of time, for example 90, 120, 180, etc. days. These are your License Days. The Subscription Time is the time frame in which you can start the License Days you purchased. Once you activate the program the License Days start and run consecutively. Access to your program will stop when you use all of your License Days or the Subscription Time ends (regardless if you used your License Days). For online programs you can purchase additional License Days during your Subscription Time by contacting DataChem Software.